You have questions. And we have answers. This is already starting off great! If you don’t find the answer you are looking for please contact us. Is alcohol allowed on the Social Station? Yes! As of January 2018, alcohol is now allowed on the Social Station. Each passenger is allowed to bring up to three fermented malt beverages (beer) or 36 ounces. Sorry, no hard liquor, wine, glass bottles or Jell-O shots allowed. Anyone who brings alcohol on board the Social Station will be carded and must be 21 years of age. Please note that once an alcoholic beverage is opened, it must stay on the social station. Failure to follow this law could result in a police issued ticket. What kind of alcohol can I bring on the social station? Domestic and craft beer along with spiked seltzer drinks (white claw), hard root beer type drinks, mike’s hard lemonade and just about anything in an aluminum can. Yes! However, the Social Station operates on a city-approved route that we cannot deviate from. We have 4-5 different stops we can make which means we will be in close proximity to most bars and restaurants downtown. If there are particular places you would like to know, please discuss that with your driver before your tour begins. How many people can ride the party bike? Downtown Appleton: we recommend a minimum 8, and a maximum of 15. The closer your group is to full capacity the cheaper the per person price is. Where do your pub crawls go? Wooden Nickel, Appleton Beer Factory, and Ambassadors. There is flexibility to go to other places and that can be coordinated with your tour guide. We ask that groups please arrive at least 15 minutes early. We suggest arriving early so you can, sign your waiver, get comfortable, choose your music and take pictures. 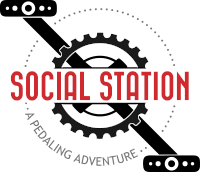 What hours does the social station operate? The Social Station, LLC operates spring, summer, and fall. Tours will be available during the holiday season and as weather permits. The only time we don’t operate is most of December, January, February and when mother nature doesn’t play nice. If this happens you will be contacted and given a future credit for a ride. What are your rules and restrictions? Simple! We ask all riders to show the same level of respect to our bike, your driver, and the city of Appleton as you would any other person or business. Individuals or groups exhibiting excessive intoxication, unsafe behavior or other inappropriate behavior will have their tour immediately terminated, without refund. Is there music on the Social Station? Can we bring our own playlist? Yes, the MegaCycle features an amplified 6-speaker sound system with Bluetooth connectivity. You have the capability to choose from nearly any genre or you can bring your own playlist and be your own DJ. What should I bring for my pedal tour? Our tours include the MegaCycle, trained tour guide, coolers, music, and entertainment. You’re welcome to bring your own beverages (alcoholic or not) and snacks. You can learn more on the Prep page. Do you offer room for storage? Yes! The social cycle has ample overhead storage for purses, jackets, and backpacks. Sorry, no guns, weapons, drugs, glass bottles, flasks, or hard liquor permitted on the social station! Do all riders need to be 21+? However, please note: minors are not allowed on the social station when alcohol is present and being consumed. Furthermore, we do not encourage children or teenagers on pub crawl and craft brewery tours. The social station is a great way to take your family on a scenic or history tour of downtown Appleton. Who should rent the Social Station? Can I jump on when I see the Social Station rolling by? Sorry, no. The Social Station, LLC provides tours for groups and nearly all tours travel at capacity, or are a private party for a special occasion. Head over to our online booking page to begin booking and select your desired tour. Use the calendar to navigate to your date, then select one of the available time slots. You will see only tour times that have not been booked already. All you have to do is enter your credit card information to pay in full. Our system does not allow for a deposit or partial payment, and your card will be immediately charged. Pricing varies by time and day. You can book either by the bike or by the seat. Please see our booking page for pricing and availability. You can pay by Visa, MasterCard, and American Express. We do not have an option to pay in cash. Head over to our booking pages to begin booking! Of course! This is a perfect birthday gift, anniversary, graduation and so much more! Click here to gift the Social Station. Refunds are not given unless a tour is canceled by the Social Station, LLC due to weather that is deemed unsafe. We do our best to work with every group around cancellations. However, last-minute rescheduling or cancellations may be subject to a cancellation fee. Tours canceled or postponed due to weather have the flexibility of rescheduling to another time and day for an entire year! The social station will operate in light rain so please dress appropriately for the forecast. If we need to reschedule, we will do our best to ensure we can find an alternative date for your group. Do you combine small groups on the social station? Can my group of less than 8 ride? Sorry, we need a minimum of 8 riders in order to move the social station and provide an enjoyable experience. We cannot combine small groups. With online reservations and payments, it is challenging to coordinate and accommodate. To provide the best experience, it is best to keep the social station reserved for your group only or book by the seat. We strongly encourage tipping. Our drivers work hard to provide an incredible experience for you and your group. If your group enjoyed the ride, then please consider tipping $5-$10 per person. 2 1/2 and 3-hour routes are also available on custom tours. If you are interested in an extended tour or renting the bike for the whole day or special event or outing, please shoot us an e-mail and we will provide a quote within 48 business hours. We hope we have the opportunity to serve you!